Case starts, Zara says to Kabir that our Prophet asked us to go and study, he didnt say that for men only. Kabir says she can go with a family member. Zara says her father will drop her and she will live in a women hostel. Kabir says I am talking about what our religion allows. Zara says they said to not send girls out earlier because it was not safe but now we have security, aeroplanes and hostels for women so why Hina cant go? Kabir says our Prophet allowed a woman to be part of war but she had to bring her family member, Hina has to take her family member with her otherwise she cant. Zara says bu.. Kabir says enough. Hina cries. Hina’s father comes there and says my daughter will become doctor, my wife will go with her and stay there. Hina thanks him. Father says thank Zara, she made me change my mind. Flashback shows how Zara told man that people are changing, your daughter’s life can change when she becomes doctor. Flashback ends. Father says your talk made me realize my mistake. All clap for Zara. Kabir looks on. Alina shows Amir’s friend Aashish’s photo to Ayesha. Kabir and Zara comes there. Kabir angrily leaves. Zara says we had argument but he will be fine. She asks for Amir? Zeenat says he is busy on phone and TV. Alina says e is worried about his friend. Zara comes to Kabir with chocolates. He glares at her. Kabir gets Irfan’s call and asks how was your head priest’s day? Kabir says your daughter argued with me a lot. Zara takes call and says he took decision against you, you sent me to study somewhere else. Kabir says you were under protection of your relative. Irfan says to Zara that Kabir is head priest too, you have to respect that, you can question him but you have to find solution. Zara says I am with women and truth, she ends call. Suraiya says to Irfan that your father did injustice and now you are doing it. Kabir says to Zara that you made her father agree and then you were arguing with me? Zara says he didnt agree before, I was not trying anything. Kabir says you just want to argue. Ayesha comes there and asks them to come for dinner. Suraiya says to Irfan that you did injustice with Rizwan by not giving seat to him. Irfan says Kabir is priest for sometime only. Suraiya says Rizwan is education in both Islam and worldly education then why dont you make him head priest? Rizwan comes there and says I dont want this seat, it made my father go away from his family, I want to serve people thats why I became doctor. He says to Irfan that I will never take that position. All sit down for food. Zeenat asks Alina to call Amir too. Amaan comes there and says Amir is crying. All come to Amir. They hear news of Aashish dying by enemy. Alina cries for him. Zara hugs her. Amir says we are proud of him, he gave life for this country. His wife Gauri and son Ankush is our responsibility. Kabir says I will go with you. PRECAP- Army gives protocol to Aashish’s death. Amir promises to kill enemies of Ankush. 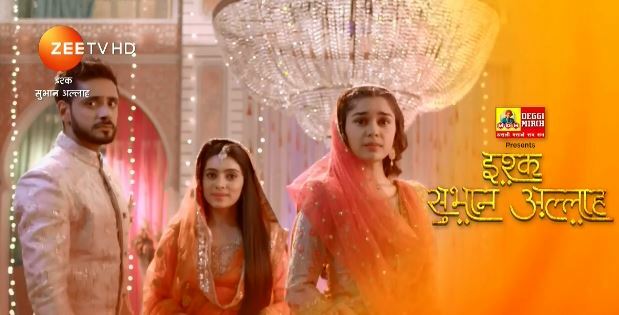 The post Ishq Subhan Allah 6th March 2019 Written Episode Update: Zara win over Kabir appeared first on Telly Updates.